Share travel tips, adventures, road recipes, and ideas for fun places to visit. 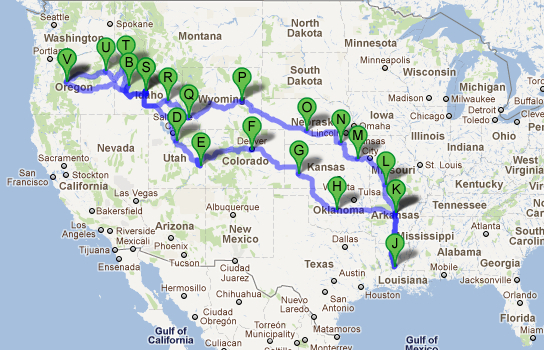 Mike and I logged just under 6,000 miles in the 30 days we were gone, from September 21 to October 22. We stayed at Mike’s folk’s house in Greenbrier for a combined eight days, and for three days with Gary and Tracy Vaughn in Louisiana. We stayed with sister Raine and her husband Chris for two days – one day going and one day on the way home. We lingered two nights each in Moab, Pocatello and Baker City. The other 17 days were all one-night stands: setting up, settling in, and breaking camp the next morning. We found RV parks on our GPS, and made up the rest as we went. Kyla’s Top Five: Visiting Raine and Chris and the Heart Tree in Hailey, Idaho; ogling the ruby slippers in the Oz Museum in Wamego, Kansas; tagging monarch butterflies in Kansas City, Missouri; rousting through flea markets with Peggy in Greenbrier, Arkansas; and snuggling in the RV with Pip to write blogs. Mike’s Top Five: Standing in the six-foot Guernsey wagon ruts in Wyoming; visiting his folks in Greenbrier, Arkansas; exploring Fort Laramie in Wyoming; riding into the history of the Pony Express Museum in Marysville, Kansas; and turning a gas shortage into a pleasant experience on South Pass, Wyoming. We’ve probably forgotten more than we remember, ate more junk food in a month than the entire previous 12 months combined, and learned to work as a team, capitalizing on each other’s strengths and picking up the slack whenever needed. We both experienced highlights that will stay with us forever. For my part, I’ll remember the freedom of being self-contained, figuring out the promises and problems of each day, and letting the wind blow us where it would. Sounds like an awesome trip. Can’t wait to hear more. Traveling is the best, especially self contained! What an adventure! Thanks for sharing so I could travel vicariously with you two road warriors. Just visiting your blog for the first time! We just recently won an a Passport 2910 BH RV from the Keystone Rv Redisvover America Sweepstakes, so we are new and trying to learn as much as we can! We’re in Pennsylvania! We just started a blog at http://www.rvmama.com. Please visit us too! Look forward to more posts from you guys! Happy Camping! That looked like a fantastic route to take. I bet there was quite a lot to see. Looks like a great way to go. Quite a few destinations. I’m sure you got to see a whole lot of sights. Amazing route! Definitely looks like you got to see quite a few things. I usually get my travel destinations from http://www.rv123.com/blog/ but it looks like you’ve seen it all as well!